This crepes recipe is a constant time saver for us even in the morning before getting everyone out the door to work and the kids to school. This is a recipe for crepes you can get all blended and onto the pan in 15 minutes flat--now that is really fast. Adding toppings of your choice inside the crepes is left to your imagination, whether you like icing sugar, cinnamon, meat, eggs, cheese or prefer peanut butter and jam, honey, cottage cheese, cream cheese with marmalade, chocolate spread, bananas, strawberries, blueberries or whatever you fancy, these crepes are a great 'thin' pancake. Breakfast, lunch, snack, dinner or dessert, this crepes recipe is so good we are sure you will hear the same compliments "these are yummy, can I have another one?" every time you serve them. Try them today for a quick and painless change from your regular breakfast or lunch. Here is our quick 3 step crepe recipe guide for the 'dry' ingredients, 'wet' ingredients and blending it all together. Stir all 'dry' ingredients in a large mixing bowl and set it aside. Blend all 'wet' ingredients in blender on medium. If the batter's consistency is too thick I like to add up to a 1/4 cup of water to thin it out. 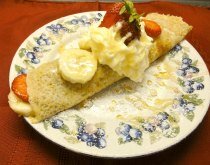 Fill your crepes with fruits, condiments, dinner or dessert fillings as desired. This is one of the best recipes for crepes that will make a hearty and healthy meal or a super sweet dessert that will keep you and your family full until your next meal. You and your whole family are going to thoroughly love these crepes. We love making this easy Crêpe Recipe for breakfast and lunch. What are your favorite fillers?